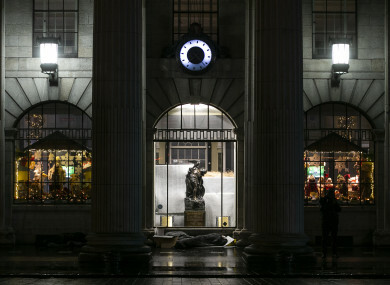 A person sleeps outside the GPO on O'Connell Street. THE NUMBER OF families who are homeless has increased by 20 to 1,728 last month, the latest figures show. Of the 20 families who became homeless, one family was in Dublin and 19 of them were across the country. Emergency accommodation numbers, compiled by the Department of Housing, show that there were 9,968 people living in homeless accommodation last month, an increase of 244 people on October’s figures. That represents an increase of “158 adults and 86 dependents”; the Department said that there had also been a decrease in the number of families presenting themselves to homeless services in Dublin “where the challenge is most difficult”. Approximately 182 beds for those sleeping rough were added to the system. It is very disappointing to see more children in emergency accommodation as we enter into Christmas week. The Department said that 67 families exited emergency accommodation into homes, and 85 families were prevented from entering emergency accommodation in Dublin during November. “I want to assure all individuals and families experiencing homelessness that it is an absolute priority for my Department to deliver the housing solutions needed,” Murphy said. In 2019, we will continue to increase the delivery of social housing to provide more people with homes. According to Focus Ireland, new figures that they released today show that “one child became homeless every 4 hours last month in the capital city”. “There is real danger that the people get lost behind the numbers. Christmas is a time for us all to reflect on our lives and our society, and I hope that everyone across Ireland, as they enjoy their family and home this Christmas will give some thought to the 4,000 children who do not have a home, and join us in Focus Ireland in new year resolution that we must do so much better in 2019. Email “Over 1,725 families and 3,800 children: Homelessness increases before Christmas”. Feedback on “Over 1,725 families and 3,800 children: Homelessness increases before Christmas”.